B&M Care who bought the old Youth Centre site and lost their appeal to build a 56 bedded care home in October last year have last week chopped to the ground a cherry tree orchard next to the site that has been there since in the 1890s. They bought the extra land where the orchard was from Oakford Homes who are developing the old Wilkins site but this wasn’t part of original planning application that was turned down. 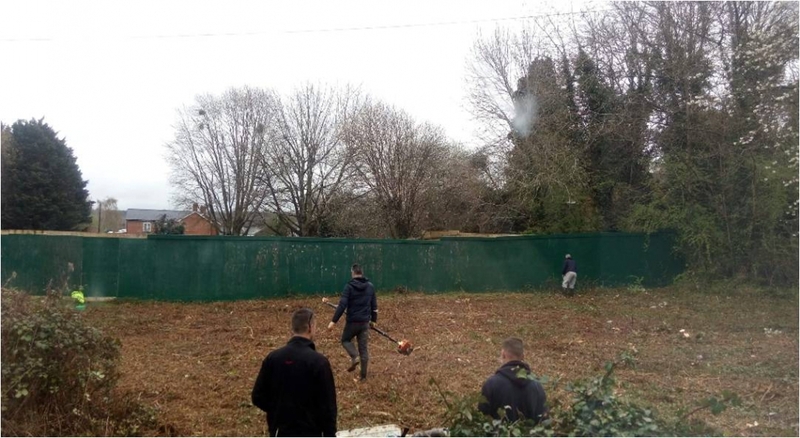 The workman also cleared the hedging and brambles that left the site open which in turn led to some anti-social behaviour take place on the site. B&M Care home finally secured the site this week with a proper fence after repeated requests. Henley Town Councillor Kellie Hinton was contacted and asked SODC Planning officers to investigate whether any planning breaches had taken place including the cutting down/trimming of any trees that may have Tree Preservation Orders (TPOs) on them. SODC enforcement have now confirmed that there are trees with TPOs on them that have been trimmed. Action will now be taken against B&M Care. James Bradshaw from B&M Care was asked to stop the destruction of the orchard at the time by the resident. We have asked him for response but to date we have not received a reply. The area in question was 6 feet high with brambles and wasn’t maintained like the lady reckoned she had.the only cherry trees cut down were self set and under 4 inches .the area has benefited from the work done.